Tickets for Porgy and Bess starring Rhiannon Giddens will go on sale Friday, Jan. 11 at 10 a.m. at ticketmaster.com, the Greensboro Coliseum Box Office and charge-by-phone at 1-800-745-3000. 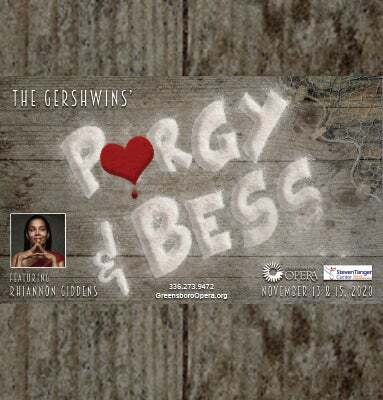 Presented by Greensboro Opera, Porgy and Bess will take the stage at the Steven Tanger Center for the Performing Arts for two performances, November 13 and 15, 2020. The first announced event booking for the Tanger Center, the production will feature Giddens, a Grammy-award winning musical artist and Greensboro native, as Bess. George Gershwin called his masterpiece, Porgy and Bess, a “folk opera.” With familiar tunes such as “Summertime,” “I Got Plenty o’ Nuttin’,” “It Ain’t Necessarily So,” and “My Man’s Gone Now,” this greatest of American operas is a story about community: love for each other, struggles and redemption, and overcoming adversity. Grammy-award winning Rhiannon Giddens (Bess) is a Greensboro native and a UNCG alumna. A 2017 MacArthur Foundation “Genius Grant” recipient, Giddens is a classically-trained singer with operatic credits such as the title roles in Gounod’s Roméo et Juliette and Carlisle Floyd’s Susannah, as well as Beth in the North Carolina premiere of Mark Adamo’s Little Women, the latter two winning first place for the UNCG Opera Theatre in the National Opera Association’s Opera Production Competition. In December, Giddens launched a podcast series entitled "Aria Code" produced by The Metropolitan Opera and WNYC. She was also recently named as a finalist for the 2018 "Tarheel of the Year" by the Raleigh News & Observer. Founded in 1980, Greensboro Opera is a community based company dedicated to fostering the growth of opera, and to presenting professional productions of the highest artistic caliber for the enjoyment, education, and enrichment of the Triad region of North Carolina. GO’s vibrant educational programs reach thousands of students each year. In addition to its annual mainstage production in UNCG Auditorium, GO is deepening its partnership with Well-Spring Life Community as an anchor tenant in its new $12-million dollar Theatre at Well-Spring, including producing Hansel and Gretel in March of 2019. www.GreensboroOpera.org.